Super straight flexi floss in very generous hanks. Perfect for making buzzers and segmented bodies. This funkyflexi is NOT made of rubber so does not go brittle and hard. Made from the same material as regular FunkyFlexi but a much smaller diameter. 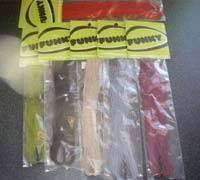 Perfect for tying tiny flies adding to dubbing or using for legs.